A surveillance camera atop Lord & Taylor (circled) took images across Boylston Street of the area where the second bomb exploded Monday. The site is in front of the red brick building halfway to the rear of the photo. 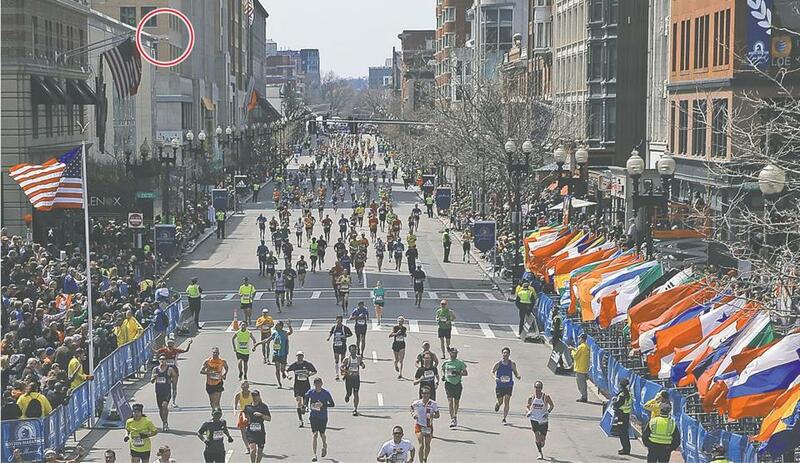 In a potential breakthrough in the investigation into the Boston Marathon bombing, investigators have isolated ­images of a suspect carrying and perhaps dropping a black bag believed to have held one of two bombs that exploded 12 seconds apart Monday near the finish line of the historic race, said an official briefed on the investigation. 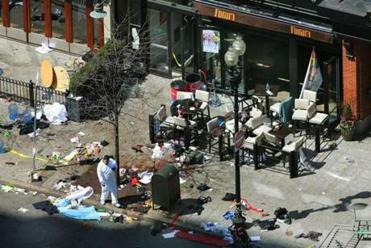 Authorities were “very close” Wednesday in their pursuit of the bomber, said the ­official, who declined to be named. A surveillance camera at the Lord & Taylor store, across Boylston Street from the ­Forum restaurant where the second bomb exploded, has provided video of the area, though it was unclear whether the image of the suspect came from that camera, the official said. A second person briefed on the investigation indicated that the image may have come from a cellphone. Investigators pored over the location on Tuesday. Disclosure that a bomber had been caught on camera came on a tumultuous day filled with a seesaw of emotion, due to disputed reports that police had made an arrest in the case, and as Boston prepared to receive President Obama to speak at an interfaith service Thursday. Journalists and spectators converged on the Moakley ­federal courthouse Wednesday afternoon, expecting a suspect to be brought in. Top law enforcement officials denied they had anyone in custody, and the courthouse was evacuated after a bomb threat. After a search of the building, employees and visitors were allowed back inside. The Marathon Monday explo­sions killed three people and injured more than 170, many of whom were grievously maimed. On Wednesday, author­ities confirmed the identity of the third victim, Boston University graduate student Lingzi Lu, who was from China. Martin Richard, an 8-year-old from Dorchester and 29-year-old Krystle Campbell, a native of Medford, were also killed. 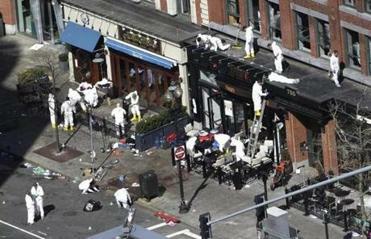 Sixty-two people hurt in the blasts remained at Boston hospitals Wednesday evening; 12 were in critical condition. President Obama signed an emergency declaration Wednesday for Massachusetts and ordered federal aid to supplement the local response to the bombings. At the service, to be held at 11 a.m. Thursday at the Cathedral of the Holy Cross in the city’s South End, the president will try to comfort a community in deep mourning, as he has done ­after mass murders at Fort Hood in 2009, Tucson in 2011, and Aurora, Colo.. and Newtown, Conn., in 2012. Federal officials sprinted to the federal Moakley courthouse after an evacuation order was issued. After a search, the courthouse was reopened. The Obamas are scheduled to be in Boston several hours, which suggests they may also be meeting with bombing victims. Governor Deval Patrick said he was uncertain of the president’s itinerary, but “I know that both he and Mrs. Obama have an interest in visiting victims and/or with hospital staff. I think they’re also very cautious of the disruption” caused by a presidential visit and the security it ­requires. The Associated Press first reported at about 2 p.m. Wednesday that a suspect had been “taken into custody” and was “expected in federal court” on the South Boston waterfront. AP did not name the source of the information. CNN followed with a tweet saying “arrest made” in the case. The Globe, relying on information provided by an official familiar with the investigation, sent out tweets and posted a story Wednesday afternoon reporting that a suspect was in custody and en route to federal court. The FBI later ­issued a statement saying “no arrest has been made,” while other public officials have said no one was in custody. After further reporting, the Globe is no longer convinced that its previously reliable source had accurate information. Most of the massive 12-block crime scene around Copley Square remained closed for a third day Wednesday, as investigators continued their painstaking search for evidence. 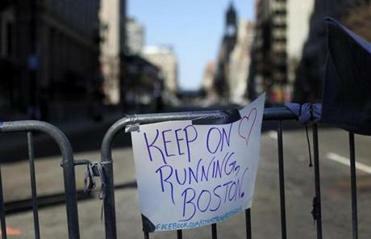 A note of support and defiance was posted on a barricade on Boylston Street, near the site of the twin bombings. Police allowed James ­Brennan, an employee of ­Sugar Heaven, a candy store at 669 Boylston St., inside the barricaded zone to retrieve the store’s security footage. 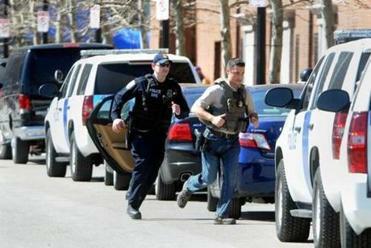 Boston police “called my boss, and he called me to see if I could come in real quick and do it for him,” said Brennan. Also, for the first time since Monday’s explosions, Boston police allowed residents to ­enter the crime scene, one by one, going into a nine-story complex at 28 Exeter St. The Copley MBTA station remained closed and is expected to be off-limits again on Thursday. Security fears led to the partial evacuation of Brigham and Women’s Hospital at about 3 p.m. Wednesday, after a driver pulled up to the valet entrance at 45 Francis St. and left the car unattended and ­apparently locked. Valets noticed gas cans ­inside, and hospital security ordered an evacuation ­“because it’s post-Marathon,” hospital spokeswoman Erin McDonough said. Within a few minutes, people were ­allowed back inside. Patrick said he is trying to find the right words to lead the state in a time of anxiety and uncertainty. “It’s hard to say anything that is exactly right, but I feel the frustration and the anger that a lot of people are feeling,” Patrick said. “I feel the notion that someone would take a civic ritual like this and would turn it into something dangerous is infuriating to me. The governor declined to speak in detail about the inves­tigation, but confirmed that police are making progress. “Every time they find and document and record or send off a piece of evidence, it’s progress, because the way this story will get pieced together is in pieces,” he said. The maker of the pressure cooker, Fagor America Inc., ­issued a statement saying the company has been contacted by investigators and is cooperating. “All personnel in Fagor America Inc. are deeply saddened by this week’s tragic events in Boston and share in the suffering of the victims and their families,” the company said.